任云伟, 王惠初, 初航, 相振群, 康健丽, 田辉. 辽吉古元古代活动带中变质富铝沉积岩系地球化学特征及其对物源的制约[J]. 地质通报, 2019, 38(2-3): 371-387. 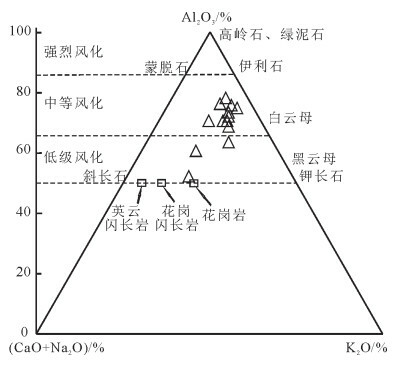 Ren Y W, Wang H C, Chu H, Xiang Z Q, Kang J L, Tian H. Geochemistry of the metamorphic Al-rich sedimentary series and its constraint on provenance in the Paleoproterozoic Liao-Ji active belt[J]. 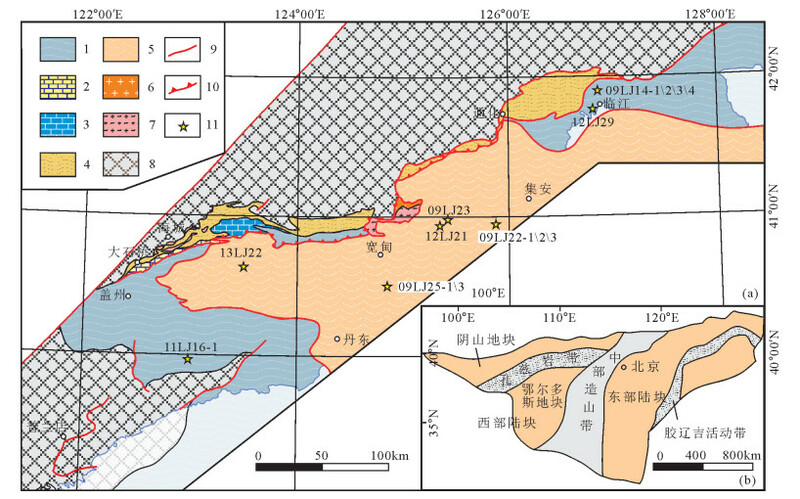 Geological Bulletin of China, 2019, 38(2-3): 371-387. Abstract: Liao-Ji active belt contains various types of rocks and is characterized by widely distributed sedimentary rocks which can record material source information and provide significant evidence of Paleoproterozoic tectonic evolution of the Liao-Ji active belt. 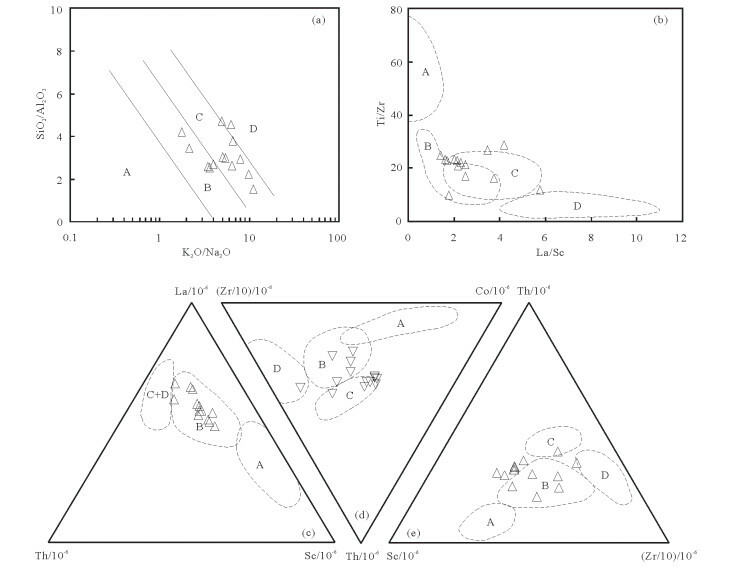 In this study, representative low compositional maturity sedimentary rock samples were collected from the active belt and a detailed research on geochemistry was carried out. It is shown by discriminant diagram that the sandstone types of he metamorphic Al-rich clastic rocks are greywacke and shale. 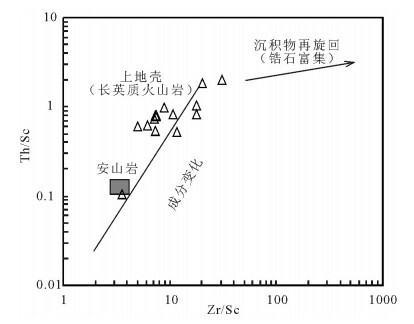 Low CIA index, low to mid-degree weathering condition and the consistent rare earth and trace element distribution indicate that all the samples were from the same source which underwent rapid accumulation in an active background with no obvious sedimentary cycle. The geochemical features of the Al-rich clastic rock reveal that the material source was felsic rock formed in a continental island arc or an active continental margin tectonic setting. In combination with previous zircon age obtained in the study area, it is concluded that material source of the Al-rich sedimentary series was formed in Paleoproterozoic, implying that the Paleoproterozoic terrane which served as the material source of the Al-rich clastic rock had tectonic setting features of continental island arc or active continental margin, and that the closing process of the Liao-Ji active belt was probably associated with arc continental collision in an active continental margin tectonic setting. 白瑾. 华北陆台北缘前寒武纪地质与铅锌成矿作用[M]. 北京: 地质出版社, 1993. 李三忠, 刘永江, 杨振升. 辽吉地区古元古代造山作用的大陆动力学过程及其壳内响应[J]. 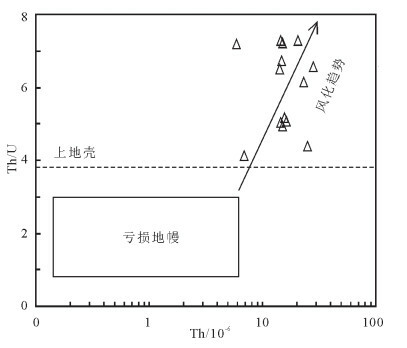 地球物理学报, 1998, 41(增刊): 142-152. 李三忠, 韩宗珠, 刘永江, 等. 辽河群区域变质特征及其大陆动力学意义[J]. 地质论评, 2001, 47(1): 9-18. 赵国春. 华北克拉通基底主要构造单元变质作用演化及其若干问题讨论[J]. 岩石学报, 2009, 25(8): 1772-1792. 张秋生. 辽东半岛早期地壳与矿床[M]. 北京: 地质出版社, 1988: 115-181. 陈荣度. 辽东裂谷的地质构造演化[J]. 中国区域地质, 1990, 4: 305-315. 杨振升, 李三忠, 刘永江, 等. 大造山带中的隆-滑构造——一种前造山期伸展构造型式[J]. 长春地质学院学报, 1995, 4: 361-367. Liu J, Liu Y, Chen H, et al. 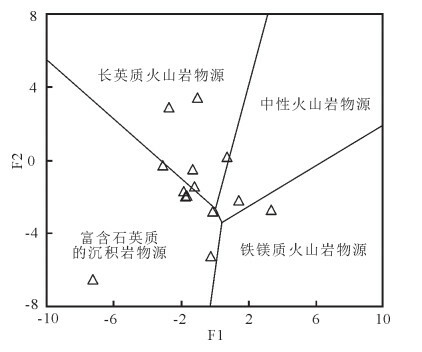 The inner zone of the Liaoji paleaorift:its early structures and structural evolution[J]. Journal of Asian Earth Sciences, 1997, 15(1): 19-31. 李三忠, 郝德峰, 韩宗珠, 等. 胶辽地块古元古代构造-热演化与深部过程[J]. 地质学报, 2003, 77(3): 328-340. 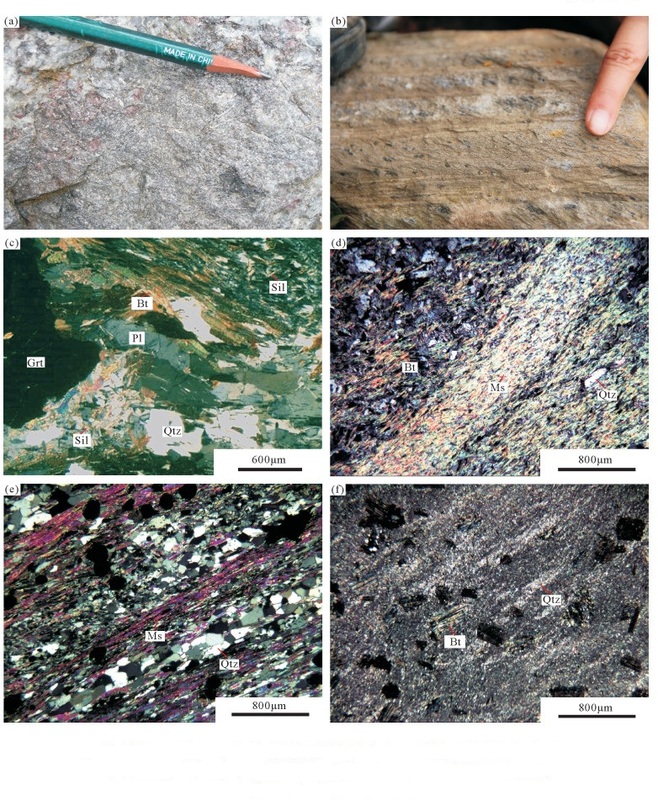 Li S Z, Zhao G C. SHRIMP U-Pb zircon geochronology of the Liaoji Granitoids:constraints on the Paleoproterozoic Jiao-Liao-Ji belt in the eastern block of the North China craton[J]. Precambrian Research, 2007, 158(12): 1-16. 王惠初, 陆松年, 初航, 等. 辽阳河栏地区辽河群中变质基性熔岩的锆石U-Pb年龄与形成构造背景[J]. 吉林大学学报(地球科学版), 2011, 41(5): 1322-1361. 王惠初, 任云伟, 陆松年, 等. 辽吉古元古代造山带的地层单元划分与构造属性[J]. 地球学报, 2015, 36(5): 583-598. 刘永江, 李三忠. 辽宁海城-大石桥-吉洞地区早元古代花岗岩[J]. 辽宁地质, 1996, 1: 10-18. 路孝平, 吴福元, 张艳斌, 等. 吉林南部通化地区古元古代辽吉花岗岩的侵位年代与形成构造背景[J]. 岩石学报, 2004, 20(3): 381-392. 郝德峰, 李三忠, 赵国春, 等. 辽吉地区古元古代花岗岩成因及其对构造演化的制约[J]. 岩石学报, 2004, 20(6): 1409-1416. 卢良兆, 徐学纯, 刘福来. 中国北方早前寒武纪孔兹岩系[M]. 长春: 长春出版社, 1996: 195-234. 孟恩, 刘福来, 崔莹, 等. 辽东半岛东北部宽甸地区南辽河群沉积时限的确定及其构造意义[J]. 岩石学报, 2013, 29(7): 2465-2480. 刘福来, 刘平华, 王舫, 等. 胶-辽-吉古元古代造山/活动带巨量变沉积岩系的研究进展[J]. 岩石学报, 2015, 31(10): 2816-2846. 辽宁省地质矿产局. 辽宁省区域地质志[M]. 北京: 地质出版社, 1989: 33-55. 张景枝, 张永焕. 吉林省早前寒武纪地质研究[J]. 吉林地质, 1998, 17(3): 22-31. 吉林省地质矿产局. 吉林省区域地质志[M]. 北京: 地质出版社, 1988: 13-17. Simonen A. Stratigraphy and sedimentation of the SvecofennidicEarly Archean supracrustal rocks in southwestern Finland[M]. Bulletin of the Geological Society of Finland, 1953: 1-64. Herron M M. Geochemical classification of terrigenous sands and shales from cores or log data[J]. Journal of Sedimentary Research, 1988, 58: 820-829. Roser B P, Coombs D S, Korsch R J, et al. Whole-rock geochemical variations and evolution of the arc-derived Murihiku Terrane, New Zealand[J]. Geological Magazine, 2002, 139(6): 665-685. Taylor S R, McLennan S M. The continental crust:its composition and evolution[M]. Oxford: Blackwell Scientific Publications, 1985: 1-328. Bhatia M R. Rare earth element geochemistry of Australian Paleo zoic graywackes and mudrocks:Provenance and tectonic control[J]. Sedimentary Geology, 1985, 45(1/2): 97-113. Bhatia M R, Taylor S R. Trace-element Geochemistry and Sedimentary Provinces:a study from the Tasman Geosyncline, Australia[J]. Chemical Geology, 1981, 33(1/2): 115-125. Girty G H, Hanson A D, Knaack C, et al. Provenance determined by REE, Th, and Sc analysis of metasedimentary rocks, Boyden Cave roof pendant, central Sierra Nevada, California[J]. Journal of Sedimentary Research, 1994, 64: 68-73. McLennan S M. Relationships between the trace element composition of sedimentary rocks and upper continental crust[J]. Geochemistry Geophysics Geosystems, 2001, 2(4): 1021-1024. 李壮, 陈斌, 刘经纬, 等. 辽东半岛南辽河群锆石U-Pb年代学及其地质意义[J]. 岩石学报, 2015, 31(6): 1589-1605. 陈斌, 李壮, 王家林, 等. 辽东半岛~2.2Ga岩浆事件及其地质意义[J]. 吉林大学学报(地球科学版), 2016, 46(2): 302-320. 吴福元, 李秋立, 杨正赫, 等. 朝鲜北部狼林地块构造归属与地壳形成时代[J]. 岩石学报, 2016, 10(32): 2933-2947.